The hotels in Mexico’s Pacific Treasure celebrate Independence Day with different events and some very Mexican culinary experiences. Hotels in the Riviera Nayarit have programmed several events to celebrate Mexico’s Independence Day on September 15th. There’s no doubt it’s one of the very best times to spend a few days in this destination. Tequila, mariachi bands, Mexican delicacies and plenty of fun—not to mention some spectacular dinners with renowned chefs—are all part of the programs created by some of the resorts to welcome their visitors. Expect some very Mexican events at Samba Vallarta. On Friday there will be a Mexican Fair during the day and raffles at night, where the participants can cash in the play money they won at the fair. On Sunday, visitors can enjoy rides on the El demoledor (The Bone-Crusher) and on the evening of September 15th the resort will offer a folkloric ballet presentation, a Mexican dinner and a mariachi band. The entire month of September they will also feature the palo encebado, or greased pole, from Monday through Friday. Carolina, The St. Regis Punta Mita Resort’s signature restaurant and recipient of the AAA Five Diamond award, will be celebrating Independence Day with a special menu prepared by two chefs. Signature chef Jesús Durón will open his kitchen to Chef Diego Niño, winner of the 2016 Millesime Young Talent award, from Mexico City’s Nexo restaurant. Together they will create a special dinner to commemorate Mexico’s Independence, accompanied by wines from the house of Monte Xanic. Durón and Niño, both talented young representatives of the nation’s cuisine, will offer attendees an interesting look into their own work with some of the best chefs in the world including Joan Roca and Martín Berasategui, as well as the influence of the Riviera Nayarit on their cooking. The drink menu will be complemented by the Maestro cocktail, in honor of the patron hero of Nayarit, created by Jorge Carrillo, the resort’s head mixologist and winner of the 2016 Hennessy Very Special award. Vidanta has prepared a spectacular evening in their Convention Center, which includes a Mexican buffet, open bar with national spirits, fair games, prizes, live music and folkloric dances with more than 20 people on stage. Take advantage of your Vidanta Card discounts! Villa Group hotels Villa La Estancia and Villa del Palmar Flamingos are celebrating the entire month of September with plenty of good food, folklore and Mexican culture. 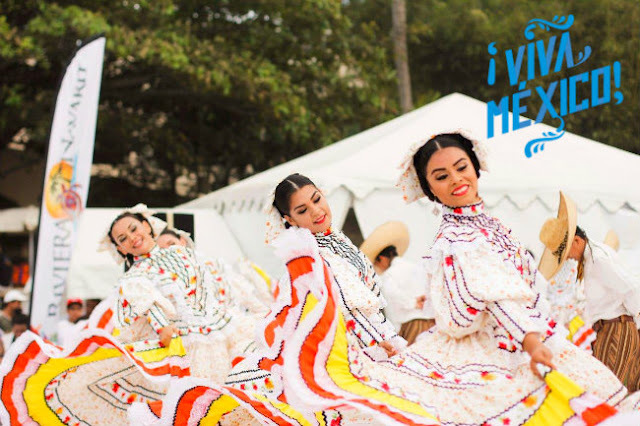 Every Monday visitors can enjoy a Beach Party starting at 7 p.m. On Wednesday it’s Mambo Kings Night and a folkloric ballet; and for movie lovers, there will be Mexican Movies Under the Stars. The resort is also offering Mexican drinks and mescal tastings.